Rep. Mark Takano speaks out against President Trump’s new policy while protesters hold up “Protect Trans Troops” signs. The Japanese American Citizens League on expressed deep dismay over President Trump’s announcement on Wednesday that transgender people will be barred from serving in the U.S. military in any capacity. “This announcement is in direct contradiction to Defense Secretary [James] Mattis’ announcement less than a month ago that the Pentagon was seeking a six-month extension of time to analyze the policy and raises concerns for how this can and will be implemented,” the JACL said in a statement. “We are concerned for the rights of those already serving and the potential infringements upon their civil rights. “Our community knows all too well the implications of a ban on military service. When over 120,000 Japanese Americans were incarcerated during World War II, we were also initially barred from serving in the military. “Even when service was opened to Japanese Americans, we served in segregated battalions, which also became among the most highly decorated during the war. Among the 14,000 who served, nearly 9,486 Purple Hearts were awarded along with numerous other decorations and recognition, including the Medal of Honor. In 2010, the Japanese American WWII veterans were bestowed the Congressional Gold Medal. Members of Congress have also spoken out. Sen. Tammy Duckworth (D-Ill.), a wounded veteran of the Iraq War: “With all due respect, Mr. President Donald J. Trump — which seems to be more than you’re willing to show to thousands of servicemembers currently following your orders into danger — what are you talking about? “Experts say the costs you mentioned are at most just 0.13% of the military budget *for healthcare specifically*. Not 13%, not 1.3%, but 0.13%. It’s indefensible for you to use those costs as a reason to deny healthcare to those who’ve risked their lives for our country at the same time you’re trying to make their healthcare cost more and cover less here at home. Sen. Kamala Harris (D-Calif.), a member of the Homeland Security and Governmental Affairs Committee: “The president’s decision to force transgender individuals out of the military is discriminatory, wrong, and un-American. We should not punish or turn away courageous people who are willing to risk their lives to serve our country — we should embrace them. 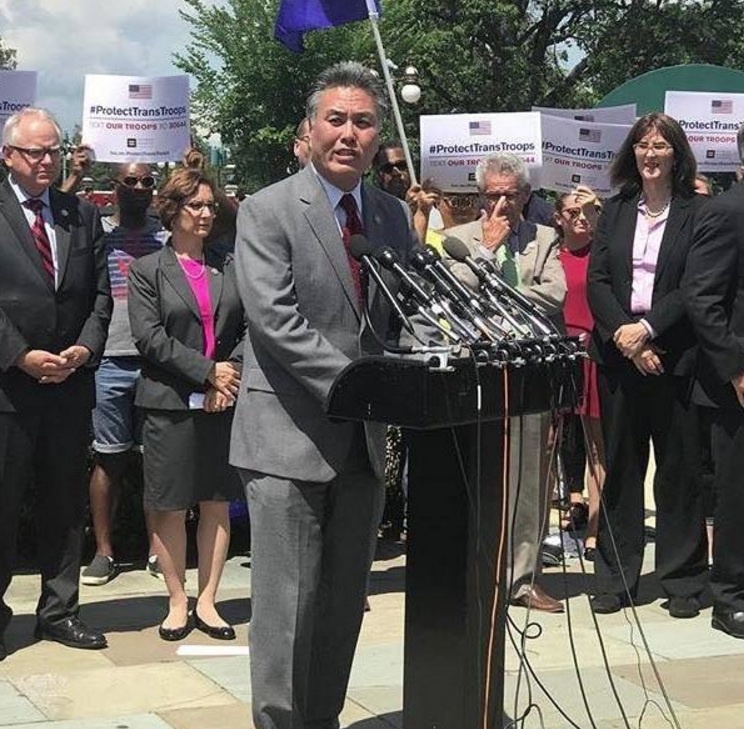 Rep. Mark Takano (D-Riverside), vice ranking member of the House Committee on Veterans’ Affairs and the first openly gay person of color elected to Congress: “President Trump’s decision to kick transgender service members out of the military reflects no understanding or appreciation for the sacrifices made by those who serve. Every American who is willing to risk their life to defend our freedom deserves to be treated with dignity and respect. And any form of discrimination against the transgender community is unacceptable. Rep. Ted Lieu (D-Los Angeles), a former Air Force officer and current colonel in the Air Force Reserve: “The president’s exclusion of Americans who happen to be transgender from serving in the military is not based on facts, it is based on naked bigotry. I know because I served on active duty. The military doesn’t care what your sexual orientation or identity is, or who you love. It cares about whether you can shoot straight and complete the mission. The president’s discriminatory decision harms our military readiness for our volunteer-based military. Rep. Tulsi Gabbard (D-Hawaii), who served two tours of duty in the Middle East and is a major in the Army National Guard: “Less than 1% of Americans volunteer to put their lives on the line to serve in our military and protect the American people. The only qualifications that should matter for those who want to serve is a commitment to uphold the Constitution, defend our country, and be capable and qualified to carry out their duties. Rep. Pramila Jayapal (D-Wash.), a member of the LGBT Equality Caucus: “This announcement represents another salvo in Donald Trump’s war on the rights of our country’s minorities and the vulnerable. A hateful ban on our brothers and sisters in the transgender community from serving in the military clearly creates a second class of citizens. “Trans rights are human rights. The Constitution promises liberty to all to define and express their identity, but my Republican colleagues are doing nothing to stop the president as he tries to shred the Constitution, tweet by tweet. It is up to all of us to resist this attack on transgender rights and liberties, and as member of the LGBT Equality Caucus, I stand shoulder to shoulder with the transgender community. Rep. Stephanie Murphy (D-Fla.), a member of the House Armed Services Committee: “Our country has always honored sacrifice and patriotism. Banning transgender Americans from serving in our military violates those values. Building a strong military that can preserve our nation’s security means recruiting and retaining the best and brightest Americans, no matter their gender identity or sexual orientation. We must continue fighting for equality for all. Rep. Raja Krishnamoorthi (D-Ill.): “The president’s ban on transgender people openly serving in the military harms our national security and military, and is a direct insult to the 15,000 active and reserve transgender service members who risk their lives every day in the service of our country as well as the 134,000 transgender veterans who have served our country with honor and dignity. “The military and numerous independent organizations have repeatedly shown that allowing transgender people to serve openly and honestly has no effect on force readiness and that any associated costs would be minimal. Today’s decision will have a detrimental effect on troop morale and military effectiveness. Asian Americans Advancing Justice, an affiliation of five civil rights organizations, issued the following statement: “America is under assault from an administration that is determined to attack every civil and human right that millions of Americans have fought and died to obtain. We stand strong in the fight with LGBTQ people and all communities of color in refusing to allow the blatant discrimination and outright attacks on our civil rights by this administration. “When President Obama signed the repeal of “Don’t Ask, Don’t Tell” into law, Advancing Justice applauded the removal of this discriminatory ban on LGBTQ community members, including many Asian Americans and Pacific Islanders. “Yesterday, Trump dishonored those in service by attempting to denigrate the transgender service members who want the chance to serve and defend the very rights the administration is now trying to deny them. “In the last 24 hours, we have been heartened by senators and representatives, senior military leadership, civil and human rights leaders, and people across the country and the world who denounced the administration’s latest act of hate. We call upon the Joint Chiefs of Staff to maintain their steadfast stance to refuse to change current military policy.